Rocky and Mayur have ventured out to explore food from all parts of India and curate videos on Askme.com. I’m contributing my part by relishing my favorite dishes at Yogisthaan and sharing my views with you all! 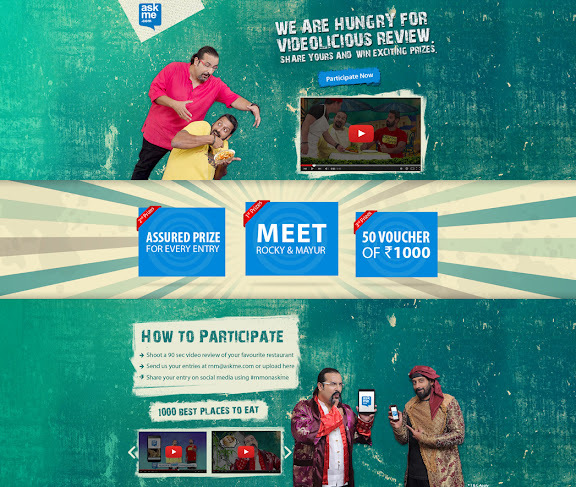 You can also upload your video review on AskMe and stand a chance to meet Rocky and Mayur. 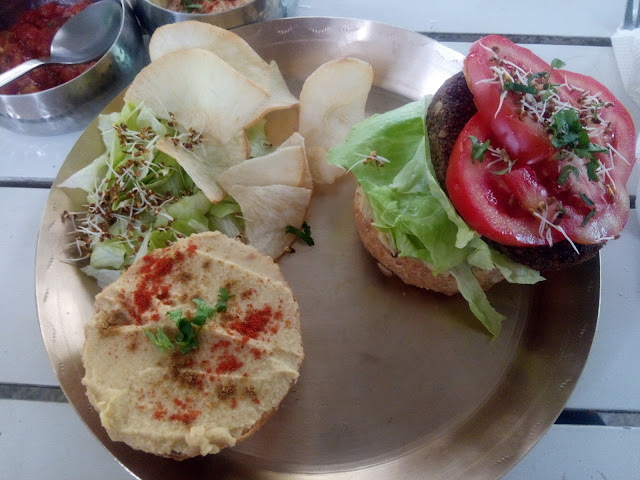 We had heard about Yogisthaan in Indiranagar area of Bangalore and were hoping to check it out soon as we have started eating healthy and this place supposedly has the most varieity of healthy food in town. 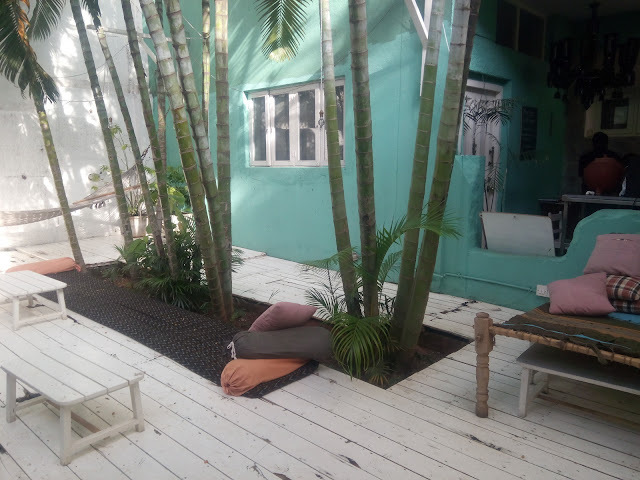 If you don’t know where exactly is Yogisthaan, you might actually miss it for being one of the quaint little houses in residential Indiranagar area. It actually is not a commercial establishment but a cafe situated inside a Yoga studio. I liked the decor of the place which is plain white with comfortable seating of low chairs and bolsters. If you wish, you can also sit on mattresses or chill out in a hammock. 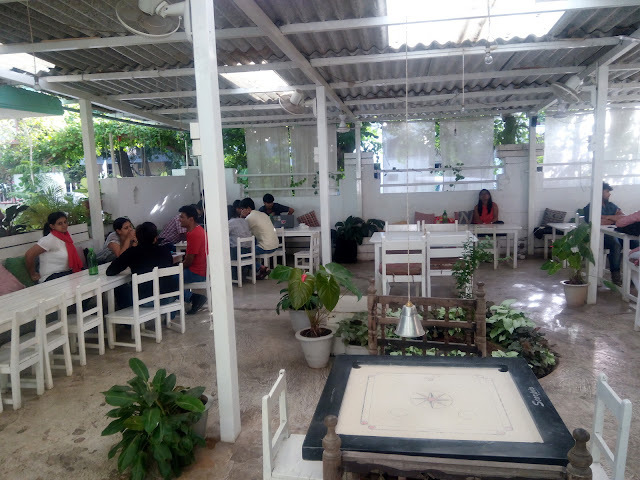 As the entire Yoga studio is immersed in a garden, you have cool breeze throughout the day which makes it a much healthier place to relax than any air-conditioned restaurant. 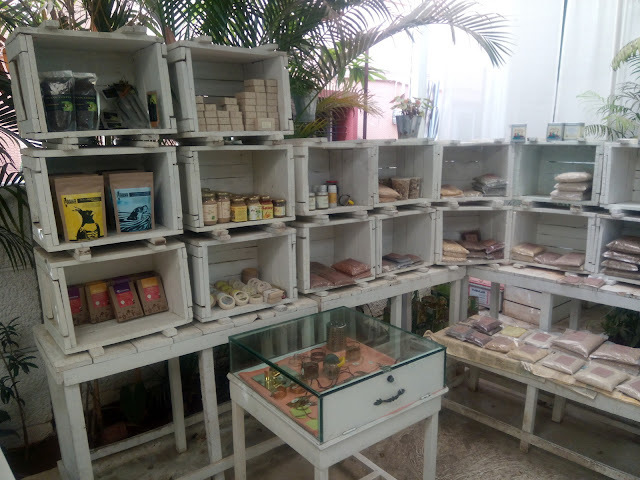 Yogisthaan being a macrobiotic cafe, has pure vegetarian organic food which is prepared on a home stove to keep the flavors intact. This is the reason orders are made one after another, so if the place is crowded, your order might take a bit of time to reach. It’s always a good idea to ask the staff about how much time your food will take. We decided to start our meal with some healthy juices. 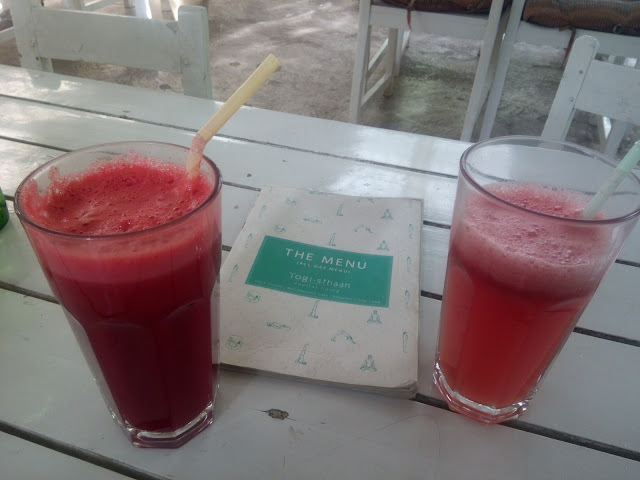 So we ordered sugarless Watermelon Juice and Booster Juice which had carrot, beetroot, coriander, amla and ginger. They provided a refreshing start to the meal. 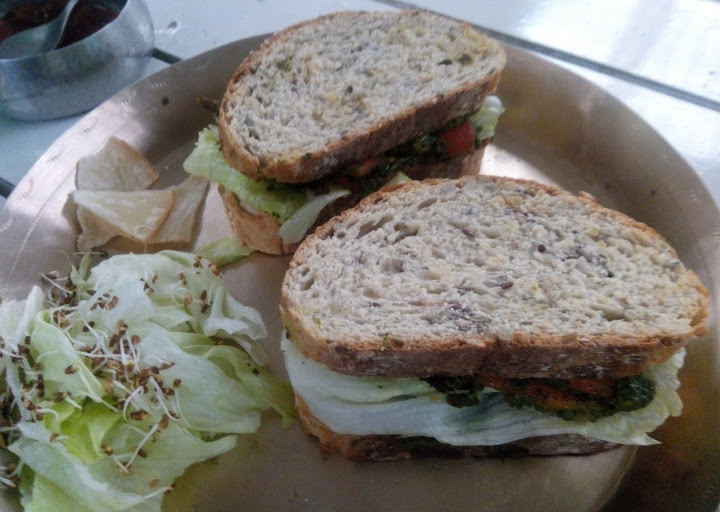 Next up was the I’m Alkalizing sandwich which is oven roasted vegetables’ sandwich. This sandwich has zucchini with paprika and marinated red peppers, with homemade almond pesto. It had the right amount of zing and the tapioca chips and lettuce salad with it provided instant bite sized energy to us! 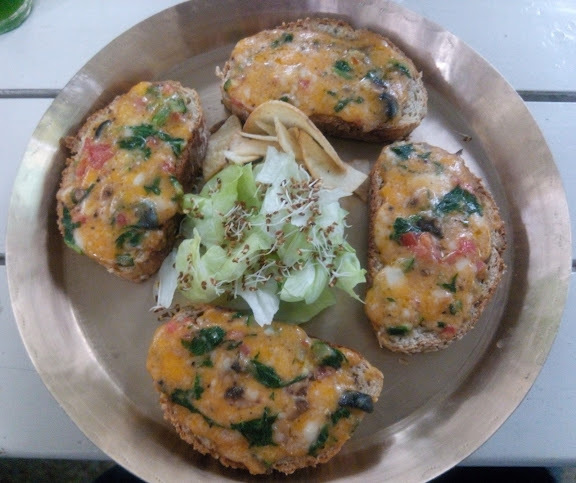 One of the highlights was the special tartine starter which had mushrooms, zucchini, spinach, tomato, black olive, mozzarella and cheddar cheese. I liked the way most of the dishes are served in brass plates which provides both healthy and aesthetic feel to the food. Next healthy highlight of the evening was the “I’m Localizing” burger which is Kodo millet burger. It has kodo millet, watermelon seeds mixed with basil, coriander, spring onions served with homemade hummus. Very healthy and very refreshing! It has a feel good factor to it. 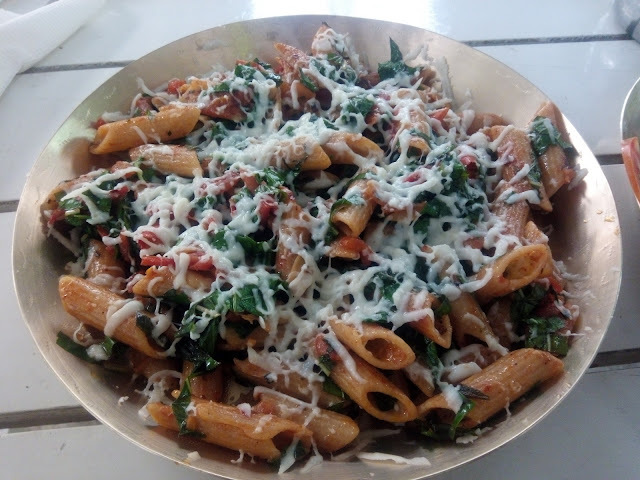 For pasta lovers who don’t want to feel guilty about the calories, try “I’m Italian” pasta which is brown wheat pasta with paprika, garlic, olive oil, tomato, spring onion, basil and mozzarella. You will definitely love the new twist with basil in this pasta. One of the starters we had was Signature Hash Browns. 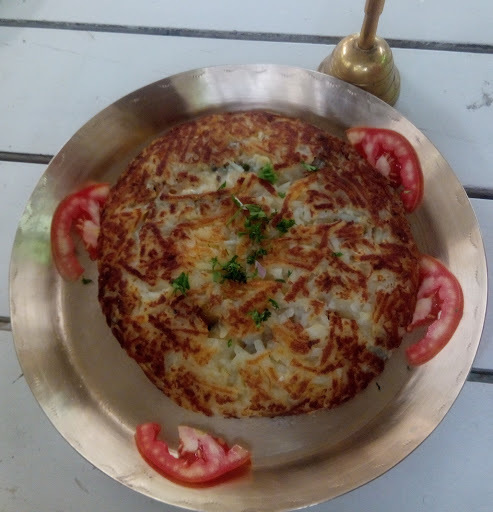 This is one big hash brown with mozzarella, red and yellow pepper, spinach and herbs served with yogurt dressing. This was the only disappointing aspect of the evening as it was too heavy to consume. Otherwise the food is great and the prices are very cheap compared to the healthy food you are eating. Yogisthaan is definitely a must visit restaurant!